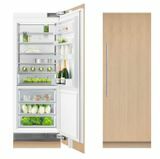 Shop our collection of advanced Fisher & Paykel french door refrigerators and bottom mount refrigerators. Also shop the Fisher Paykel integrated refrigerator and freezer columns. Our engineering team has taken this knowledge and created Active Smart™ — the world’s most advanced refrigeration system.